The King David Hotel was the site of the British military command and the British Criminal Investigation Division (CID). The Irgun chose it as a target after British troops invaded the Jewish Agency June 29, 1946, and confiscated large quantities of documents. At about the same time, more than 2,500 Jews from all over Palestine were placed under arrest. The information about Jewish Agency operations, including intelligence activities in Arab countries, was taken to the King David Hotel. A week later, news of a massacre of 40 Jews in a pogrom in Poland reminded the Jews of Palestine how Britain's restrictive immigration policy had condemned thousands to death. Irgun leader Menachem Begin stressed his desire to avoid civilian casualties and said three telephone calls were placed, one to the hotel, another to the French Consulate, and a third to the Palestine Post, warning that explosives in the King David Hotel would soon be detonated. 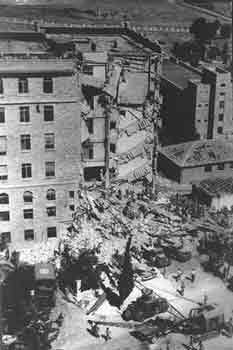 The Irgun carried out a diversion bombing minutes after the bombs were planted in the King David Hotel, in which a wagon with explosives was blown outside shops next to the hotel. The CID's assessment was that this second bombing (hurt anyone) was One of the CID officers Harouvi interviewed for his book flatly blames Shaw for the death of so many, since he could have evacuated the building on time (pages 293-297). Citing a book by Dr. Eldad Harouvi, the Israel State Archives noted, the CID had intelligence showing the Hotel as a possible target for attack by the Irgun in December 1945 – 6 months prior to the attack. The CID asked to raise security in the hotel, including putting armed soldiers at the ‘Regence’ restaurant at the entrance of the hotel. The Chief Secretary [Sir John Shaw] refused to consider these suggestions, with the justification that there were not many places for recreation and fun in Palestine, and he did not want to foreclose another. He continued to refuse to take action (or even to pass on the information to the High Commissioner of Palestine) when the CID approached him again with newer information on the attack plan (the CID had the plan of attack, but did not know exactly when it would be carried out). 5 Shaw was blamed by one former CID officer interviewed by Harouvi for the failure to evacuate the building. 4. Lord Greville Janner, Address In Reply To Her Majesty's Most Gracious Speech, House of Lords, (May 22, 1979).